With outstanding weather in the weekend forecast, Lusha planned our first hiking trip away from home for the season. 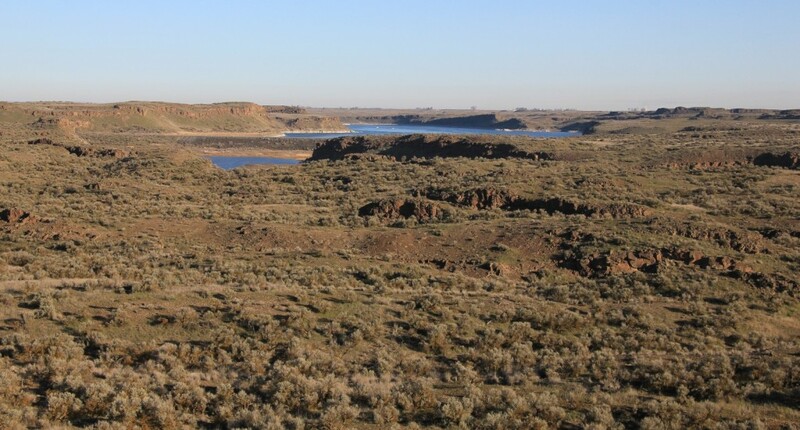 Choosing Ancient Lakes near Quincy, Washington, she hoped to maximize sun and spring-like temperatures. This was a hike she had eyed up in her Desert Hikes book for quite some time. 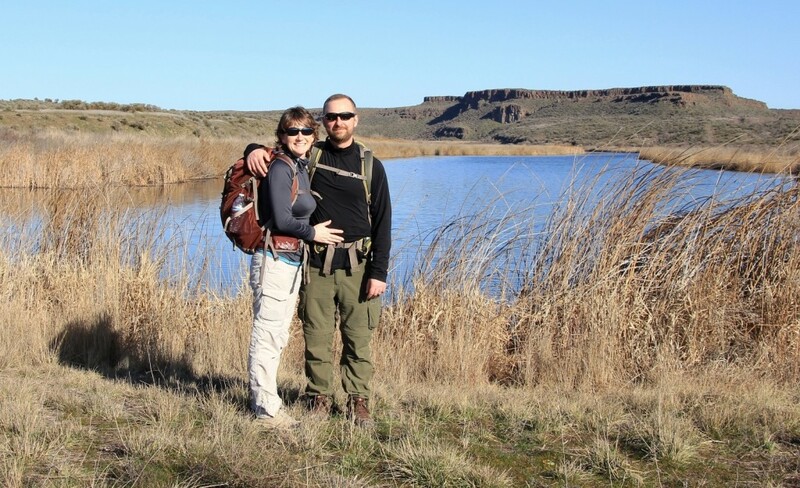 A scabland lake hike with a bonus—it includes a waterfall. 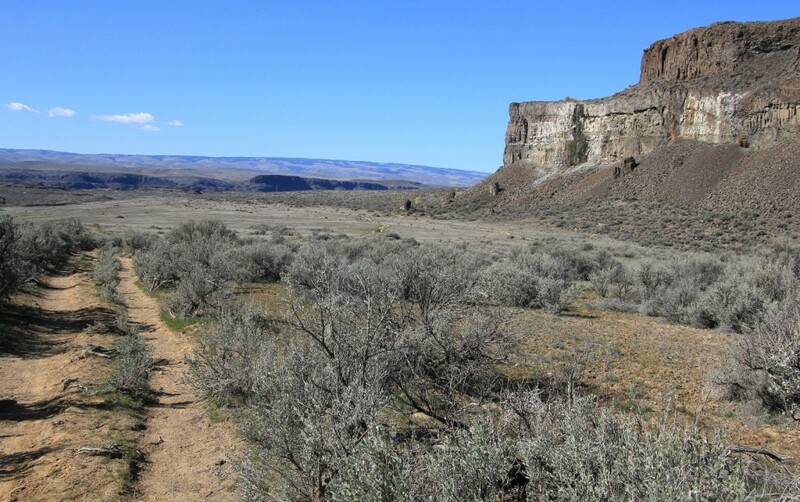 I have to say, scabland doesn’t sound like a place one should spend their time. Definitely not if you are referring to a leper colony or lazaretto. 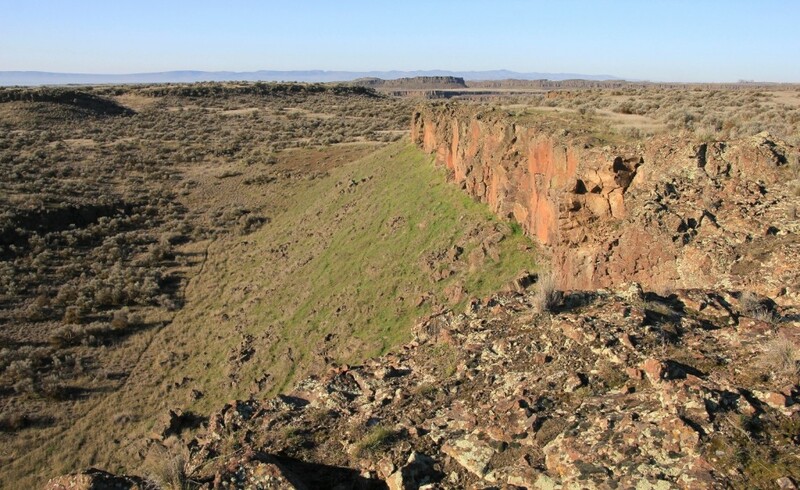 However, if you are referring to the beautifully scarred landscape of Eastern Washington, that is another matter. We left the house at 7:00 a.m., drove through Colfax, St. John, and caught I-90 at Sprague. We stopped at a Ritzville McDonald’s for breakfast and continued on. As you near Ancient Lakes the last few miles are gravel road; in good shape but a little washboardy. We made it to the trailhead by 10:30 a.m.
We figured we would see other people on such a nice day, but were surprised by the numbers. At the trailhead several groups were getting ready, including a Boy Scout troop setting out on a backpack. A gaggle of scouts with minimal supervision are makings of some righteous mischief-making. I should know—I exhibited similar behavior as a scout a few decades ago. Maybe that’s why I feel like I’m breaking the law when I’m out playing and not in my cubicle? As we were getting ready more cars pulled in. Lusha had originally planned on hiking to Dusty Lake first, but changed her mind when she saw the crowds. She figured most folks would be heading toward Ancient Lakes. Therefore, she hoped to get there first with camera in hand before others arrived. We set out with clear blue skies and 53 degrees. The trial to Ancient Lakes was mostly flat. 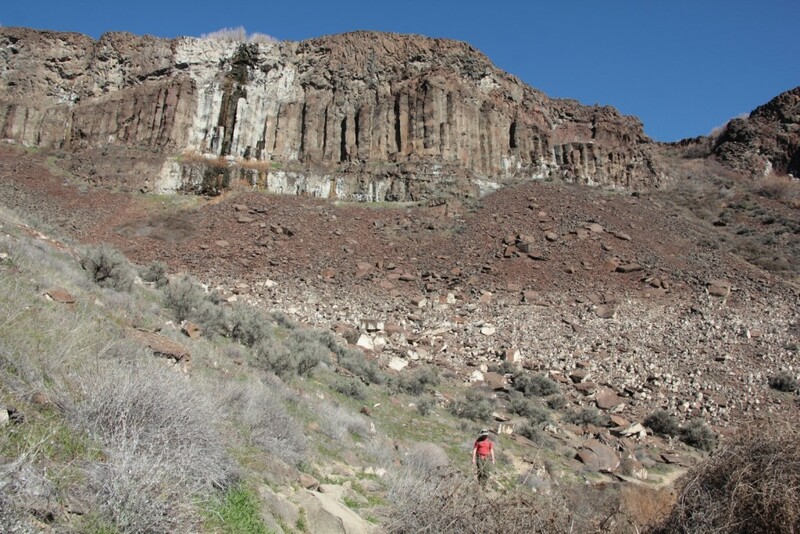 We followed the base of basalt cliffs most of the way. 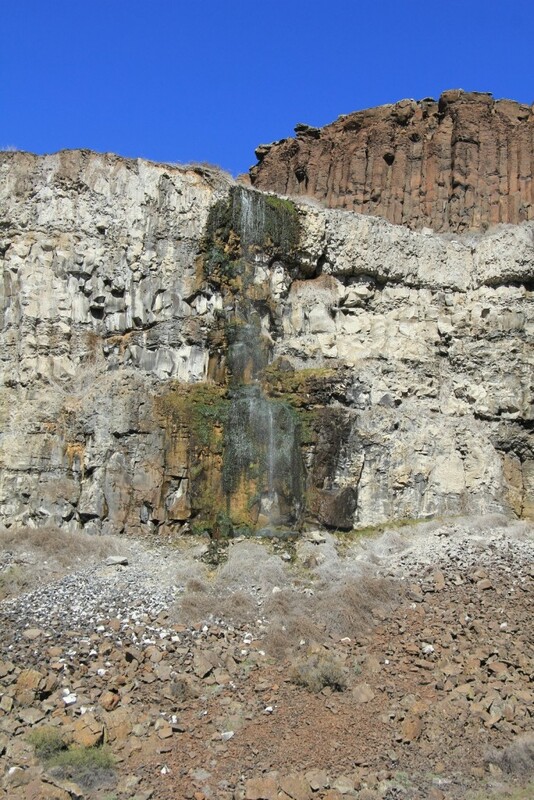 To the left were six small waterfalls flowing off the buttes. We passed a few people on the way in, but overall the trail was peaceful. We met two guys with rifles and fishing rods. They said they were hunting for coyotes, but apparently didn’t have much luck. We saw yellow buttercups, our first wildflowers of the year. 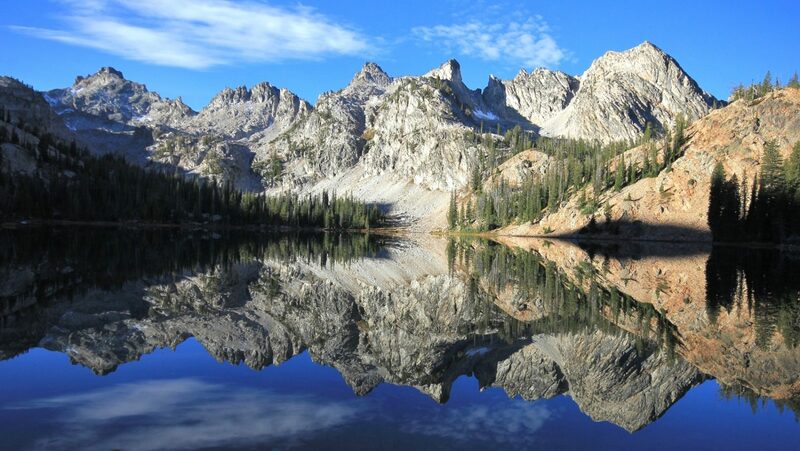 The trail includes four lakes that collectively make up Ancient Lakes. The prettiest was the last with the waterfall we had been anticipating. At this point we had a break and Lusha took some nice shots of the lake and falls. There was a little poison ivy around the lake and Lusha came close to kneeling in it as she was snapping photos. It was warm enough now that we zipped off our pant legs. As we were leaving the crowds started coming in. We saw forty people or more in a ten minute period—we made it out just in time. Next up was Dusty Lake trail. This one takes off from the same trailhead, but we did not see where it split from the Ancient Lakes trail. We made our way back and eventually came to a well-defined (if unmarked) trail to the left. The reason we missed it is because there are several spots where it splits and rejoins later. The Dusty Lake trail is one of those splits. The trick is—if you want to go to Dusty Lake first—follow all trails to the right. If you want to start with Ancient Lakes, follow all trails to the left. 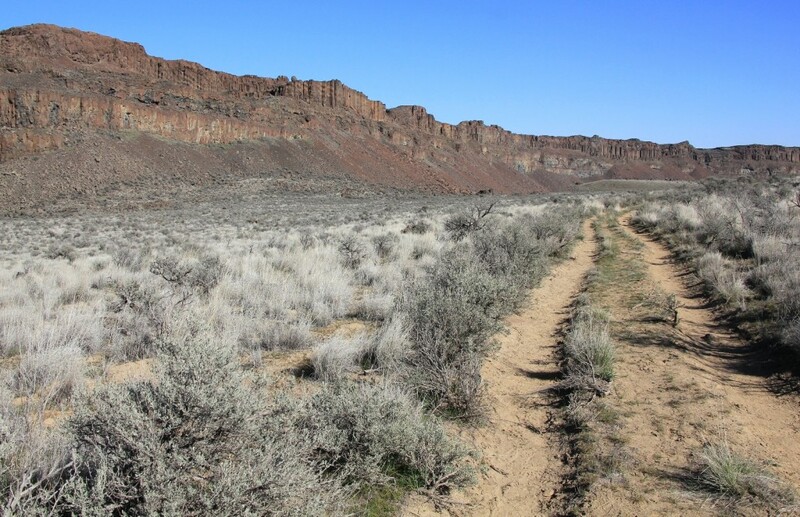 The trail to Dusty Lakes follows the opposite side of the large basalt butte adjacent to Ancient Lakes. This trail has a little more elevation gain/loss, but is still relatively flat and easy. The trail is loose sand in some places, but is mostly comprised of packed dirt and rock. Much of it follows a single track road. We only passed a few people on this stretch, which was a welcomed change from Ancient Lakes. Dusty Lake is larger than any of the Ancient Lakes. We saw fishermen on float tubes in the middle of the lake, a few fishing from shore, and two groups of tents. A Fish and Game sign indicated that this was a fly fishing-only lake. We took a break and watched ducks swimming in the shadows. By now conditions were warm on the trail, 68 degrees. I took my shirt off for my first exposure to sunlight in what felt like many months. The return trip was a bit of a slog. In a few months 68 degrees wouldn’t seem so hot, but early in the season we aren’t yet acclimated. We were both sluggish—the result of months of winter inactivity. On the way out we passed several more mountain bikers and hikers. When we made it back to the trailhead Lusha counted 40 cars in the parking lot. We had hiked 9.5 miles. I downed a cold beer and Lusha worked on a Gatorade. 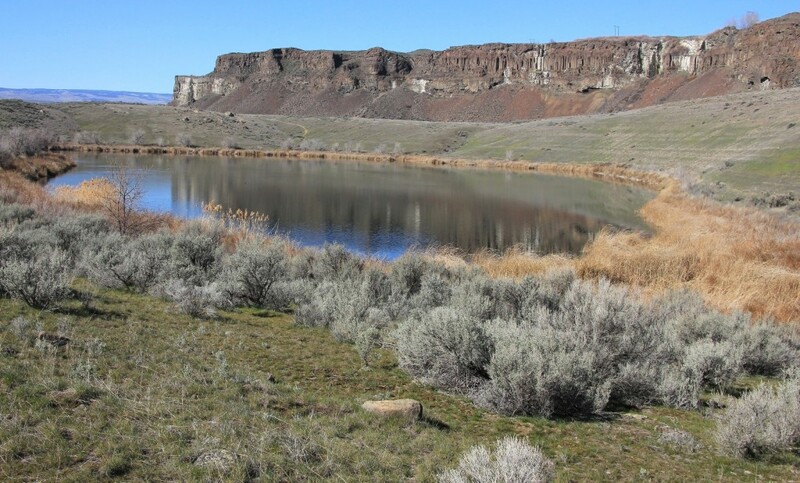 We changed into our Keens and drove to Moses Lake. Earlier in the week, Lusha had posted to Facebook asking if anyone had restaurant recommendations for Moses Lake. Her friends Amanda and Heather both said Michael’s was the place to go. It was only two miles down the same road as our hotel, so we were set. We prefer the senior time slot in late afternoon to avoid the dinner rush. We arrived at Michael’s by 4:15 p.m.—we had succeeded! Our table had a view of the lake and our waitress was fantastic. I had a beer and Lusha a Mai Tai. I had the crab stuffed chicken and Lusha bacon wrapped chicken. For dessert, we shared the half-baked chocolate cookie, which is three piping hot half-baked chocolate chip cookies topped with vanilla bean ice cream, caramel, chocolate sauce, and whipped cream. It rocked! It’s a simple idea we have since replicated at home. Sunday morning I was up at 4:00 a.m., which was now 5:00 a.m. with the time change. I went to make coffee and found an empty wrapper; only decaf was available. Uggh!!! We made it down to breakfast shortly after they opened at 6:30 a.m. We had made-to-order omelets, sausage, potatoes, and fruit. We had a nice view of the sunrise of the lake. The temperature was near 30 degrees as we pulled out of Moses Lake. We hit highway 17 and headed south toward Othello, took the Potholes State Park turn off, and at the dam turned south into Columbia National Wildlife Refuge. We followed directions from our guidebook to Frog Lake trailhead. The road was slow going in the car but doable. There were two cars in the parking lot when we arrived, but we wouldn’t see a soul the whole time we were out. It was full sun and frosty out as we started. Our first hike was to Frog Lake. The trail is well marked and has interpretive signs along the way. It climbs gently through sagebrush along dirt and sand tread. An interpretive sign indicated that the trail surface was ash from Mt. St. Helens. A little later another sign described the relationship of the lake to the surrounding ecosystem. 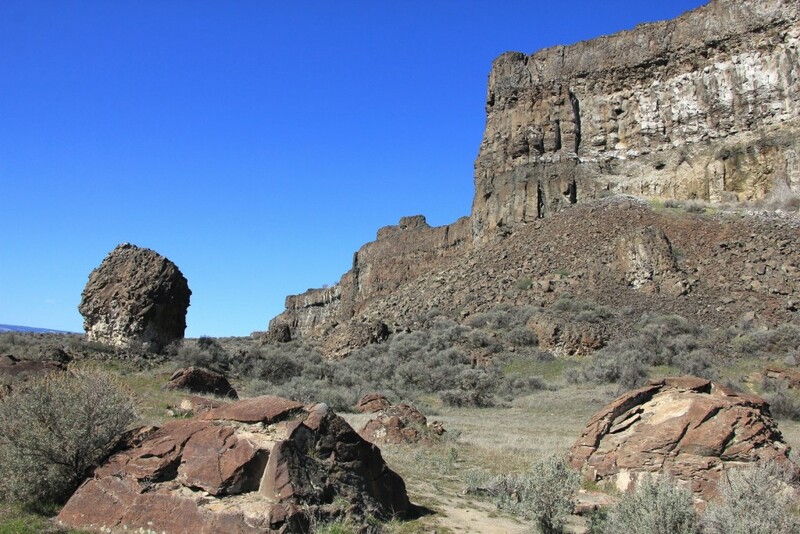 Soon we were climbing to the top of a butte, and another sign indicated that the trail loops around the top of it. We should have seen the lake by then. We circled the butte and realized we were looking down on what should have been the lake—it was bone dry. 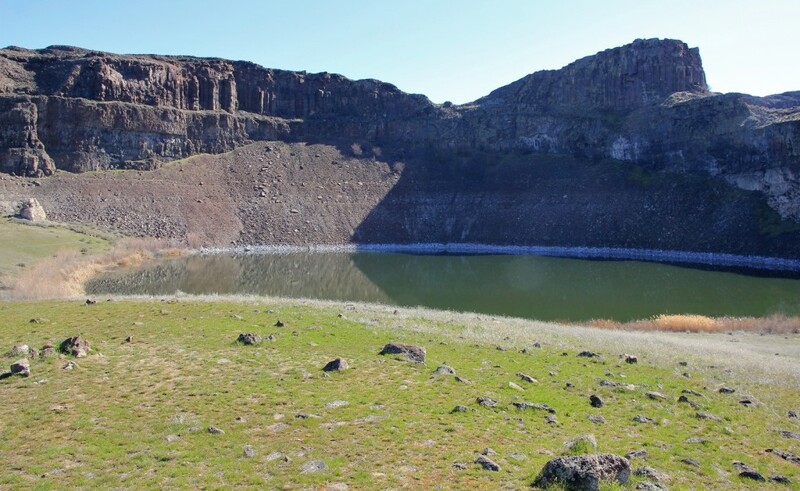 We knew the winter had been abnormally dry, but we didn’t expect a missing lake. From the top of the butte we had sweeping views of the area, including several nearby lakes. At one point we heard coyotes yipping in the distance. Despite not seeing the lake it was a peaceful hike. Total distance of the lollipop loop was 3.14 miles. Next up was a short section of Crab Creek. We hiked a little ways down the trail. It wasn’t very scenic, but it was a pleasant morning. 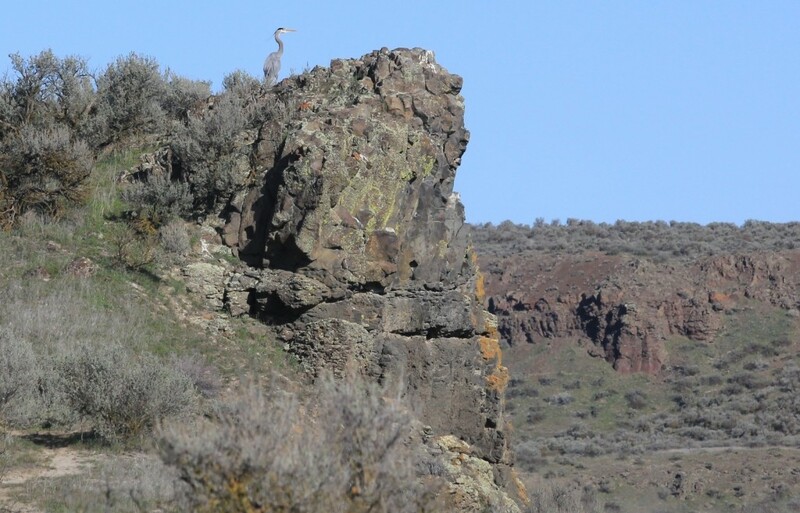 We saw a heron perched among the cliffs. He seemed out of place up that high, but he had a commanding view. After Lusha got some shots of the heron we headed back to the car. Lusha had a blister forming on her heel from her new inserts; we were ready to head home. We finished the morning with four miles of hiking. It was a great first outing for the year having had the best weather we could recall for early March. 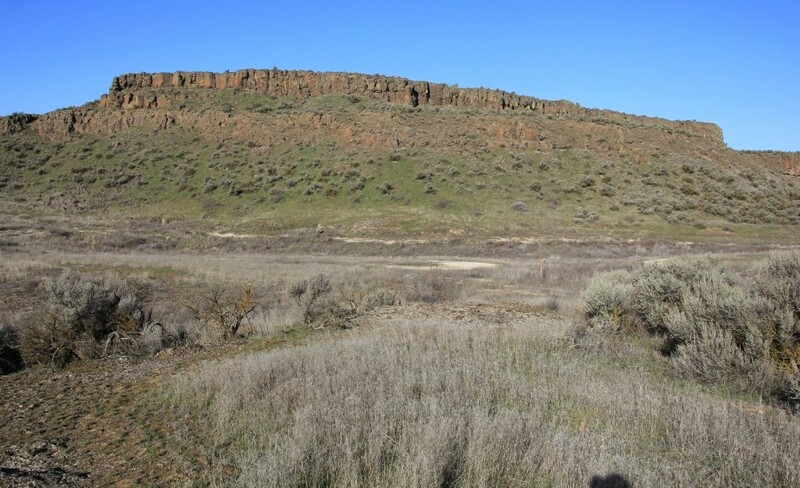 Directions (Ancient Lakes) – The turnoff to the Ancient Lakes Trail is five miles south of Quincy on SR 28. Turn west here off SR 28 onto White Trail Road and continue 3 miles. Turn left (south) at the “public fishing” sign onto a gravel road toward Quincy Lakes. The Ancient Lakes trailhead is located 0.7 mile south of the intersection with White Trail Road. 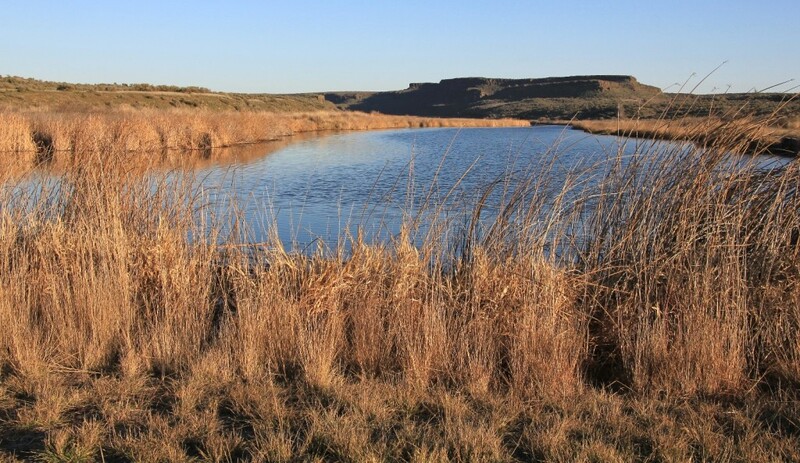 Washington Department of Fish & Wildlife permit required. Directions (Frog Lake) – From Vantage, drive east on Interstate 90; crossing the Columbia River and leaving the freeway at exit 137 (State Route 26). Drive SR 26 for 25.3 miles before turning left onto SR 262 toward Potholes State Park. 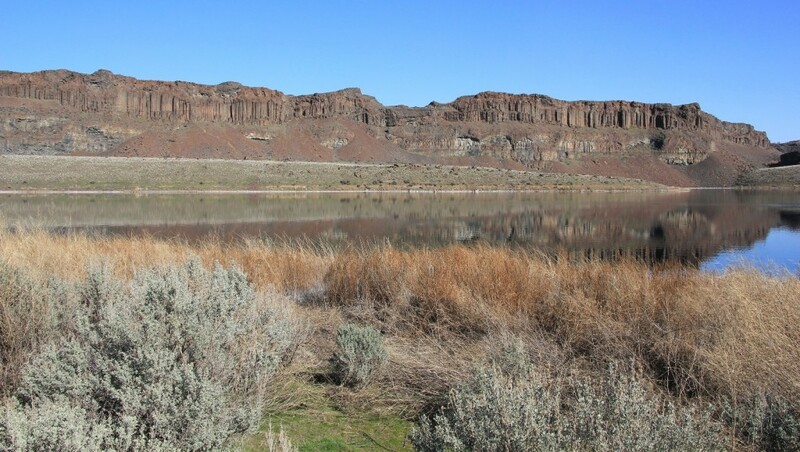 Continue 17.7 miles from SR 26, and at the far eastern end of the O’Sullivan Dam, turn right into the Columbia National Wildlife Refuge entrance signed for Soda Lake Campground and Othello (this is directly across the road from a massive public fishing boat launch site). 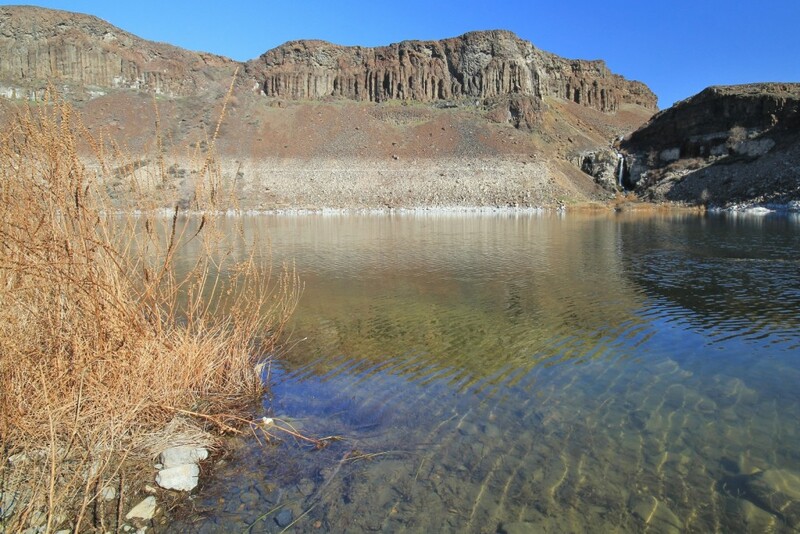 Drive into the refuge and continue past the turn to Soda Lake at 1.1 miles. Turn right at 2.2 miles, and at 2.8 miles reach the northern Crab Creek trailhead. At a junction just past the Crab Creek trailhead, keep left on the main road (don’t go straight). In another mile (3.9 miles total from the O’Sullivan Road entrance) is the Frog Lake/Marsh Lake trailhead area. The parking area is on the right (west) side of the road, and the trails begins on the east side of the road. Washington Department of Fish & Wildlife permit required.